I want people to read the menu. It’s not hard to read the menu and that is exactly what the menu is for. It is not decoration, souvenir, sketch pad, nor phonebook. It is this crazy mystical book that we give you that has all the food that you can have simply by asking. Try it. This lady comes into booth 205 and she was real nice. The man she was with was nice too if you could just ignore that huge scab he had all over his face. Seriously, all around his lips and chin area. I couldn’t tell if it was from a beating or if it was a band of herpes simplex gone rogue. But enough of him. The lady ordered a Monte Cristo. 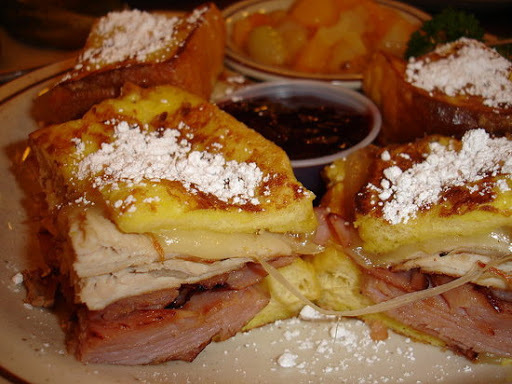 In case you’ve never heard of a Monte Cristo, just know that it is a perfectly delicious piece of health food. After it was in front of her for about five minutes, she wiggled her finger for me to come over. She did not like her Monte Cristo. “I just find it odd that you put turkey, ham and swiss cheese together on french toast, sprinkle it with powdered sugar and then serve it with syrup and jam.” Is she for real? “That’s what a Monet Cristo is,” say I. And then she says “I don’t think so…bring me a menu.” At this point it is my gleeful and sheer pleasure to get the menu so I can stand right in front of her as she reads the description of the Monte Cristo (a perfectly delicious piece of health food). I do. She does. She shuts up. I don’t offer her something else, because she ordered it, it came out as described, get over it. She asks for it to be wrapped. Read the menu next time, lady. Of course “reading” the menu is only effective if you can in fact read. I recall a lovely young man once who ordered the New York stripe steak. I asked him how he wanted his stripe steak cooked. “Well done, ” he said. This Restaurant Needs Our Help on Yelp! This entry was posted in Uncategorized on April 20, 2009 by The Bitchy Waiter.